tephanie Miskew is a Writer, Wine Educator, Certified Sommelier and author of The Glamorous Gourmet, a blog dedicated to her passions in life: food, wine, fashion and travel. The Glamorous Gourmet debuted in February 2011 as the reincarnation of Stephanie Savors the Moment, a blog which chronicled Stephanie's year-long journey cooking her way, a la "Julie & Julia," through the Junior League of Boca Raton’s James Beard award-winning Cookbook, Savor the Moment. The project was to commemorate the book’s 10th Anniversary and in the process, a new career was born! With its broader focus, The Glamorous Gourmet reflects Stephanie's take on food and wine with a sense of style, humor and down to earth approach. In addition to her blog, Stephanie has written wine reviews, educational content and wine event coverage for Cork’d, wine guru Gary Vaynerchuk’s website; the Broward-Palm Beach New Times’ “Clean Plate Charlie” blog, and the Junior League of Boca Raton’s quarterly magazine, The Bridge. Stephanie is also currently a Contributing Editor to The Preiser Key and her wine picks, food and wine pairing recommendations and music playlists have been featured in publications including the South Florida Sun Sentinel, the Palm Beach Post and Boca Raton Magazine. In addition to writing, Stephanie also conducts wine tastings and educational seminars in both public and private venues. 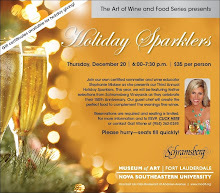 In 2010 she founded and continues to host the popular series “The Art of Wine and Food” at The Museum of Art Fort Lauderdale. She also presents at prominent local charitable events including The Boca Raton Historical Society’s “Boca Bacchanal” (she and her husband Steve were Chairs for the 2012 event which marked the fundraiser’s 10th Anniversary), The Spirit of Giving Network’s “Women, Wine & Handbags”, and the Delray Beach Public Library’s “Wine & Literature.” Stephanie has also served as a Judge for the prestigious American Fine Wine Competition, and recently joined esteemed Chef Norman Van Aken and Master Sommelier Virginia Philip as a Judge for the Inaugural Country Club Chef Showdown, benefiting Hospice of Palm Beach County. Stephanie is a Certified Sommelier with The Court of Master Sommeliers, a Certified Specialist of Wine (CSW) with The Society of Wine Educators, and a Wine Location Specialist for CIVC (Champagne) and IVDP (Port) with the Center for Wine Origins. She has also achieved her Wine and Spirit Education Trust (WSET) Advanced Certificate and in her continuous quest for knowledge, she is presently pursuing her WSET Diploma. Stephanie also received her B.A. degree in Art History from Rollins College and an M.A. in Speech-Language Pathology from the University of Colorado, Boulder. She currently resides in Delray Beach, Florida with her husband Steve and dachshunds Louis and Coco. In her spare time, she enjoys cooking, reading, traveling and, of course, drinking wine with family and friends. How do I subscribe to The Glamorous Gourmet? To subscribe, visit www.theglamorousgourmet.com and simply enter your e-mail address in the white Feedburner box in the right hand column and click “subscribe.” Within seconds you will receive an email with a confirmation link. Click on the link and you're all set. You will not begin to receive The Glamorous Gourmet via e-mail until you click the link to verify your subscription. **Note that your email will never ever be used for any other purpose than sending you news from The Glamorous Gourmet - you can also unsubscribe at any time. 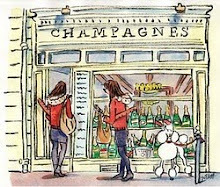 You can also follow Stephanie on Twitter and/or join The Glamorous Gourmet Facebook Fan page. Can I send you samples of my product to review? The Glamorous Gourmet is pleased to accept samples and press/media kits from wineries, distributors, marketing/public relations firms and retail shops to review. Stephanie will make every effort to review your product in a timely manner; however, she makes no guarantee that all products will be reviewed on The Glamorous Gourmet. The review given will always be her honest opinion and once a review is posted, she will do her best to provide you with a link. If you would like to provide a sample of your product, please e-mail me at Stephanie@theglamorousgourmet.com to obtain shipping information. How can I contact Stephanie? You can leave a comment on one of Stephanie's blog posts or send her an e-mail at Stephanie@theglamorousgourmet.com. Stephanie is a Certified Sommelier with the Court of Master Sommeliers and a Certified Specialist of Wine (CSW) with The Society of Wine Educators. She is also a Wine Location Specialist for CIVC (Champagne) and IVDP (Port) with the Center for Wine Origins. Stephanie's cooking education is the result of numerous cooking classes, observations in her Mother’s kitchen and many years of self-study. Her college education includes a Bachelor’s degree in Art History from Rollins College and a Master’s degree in Speech-Language Pathology from the University of Colorado, Boulder. Who takes the pictures on The Glamorous Gourmet? The pictures on The Glamorous Gourmet are all taken by Stephanie, unless otherwise indicated. They are also protected by copyright and all rights are reserved, which means you can't use them without her permission. This is true of the writing and recipes on the site as well. How do I find recipes I remember reading on Stephanie Savors the Moment? Scroll down the right hand column of The Glamorous Gourment until you find the “Search this Blog” section. Enter the name of the recipe or ingredient and click “search” to see your list of results. If you remember the month you read it you can also check the archives located right below the search box. Can I book Stephanie for a private wine tasting event or lecture? Yes, Stephanie would love to discuss your special event with you! Please send her an e-mail at Stephanie@TheGlamorousGourmet for more information. How can I find out about Stephanie's upcoming local wine events?